The largest great white shark ever captured isn’t this one allegedly caught on film off Ireland. As much as we’d like to think there was a 50-footer swimming out there, well, uh, no, there wasn’t. However, we no longer have to guess over how big the biggest great white shark ever to be caught and released alive. Thanks to “Shark Men,” we have that answer. The crew of National Geographic Channel’s hit series “Shark Men” announced a few days ago that it captured and released a world-record 17-foot, 9-inch great white shark that weighed 4,225 pounds. The old record was no slouch at 16 feet, 8 inches. The shark, named Apache, was caught off Guadalupe Island in Baja Mexico, a popular hangout for great whites. So what do they do when they catch a great white shark? They reel it alongside the research vessel and over a small platform that raises up, lifting the shark out of water. Then the pit crew goes to work collecting data and samples. They’re not quite as fast as a NASCAR pit crew, but they aren’t just changing tires, either. Apache's enormous stature was surprising to the scientists onboard, who noted that sharks that size are usually female. In fact, this was the largest great white shark the crew has seen in three years of expeditions all over the Pacific, including more than 20 sharks tagged and released. Also surprising was the fact that Apache had never before been spotted by the cage divers and photographers who frequent Guadalupe Island, a rare hot spot for shark sightings. Somehow, this giant eluded all of those cameras for years! Explorer and Shark Men expedition leader Chris Fischer acknowledges his crew's new record, but does not lose sight of the work at hand. 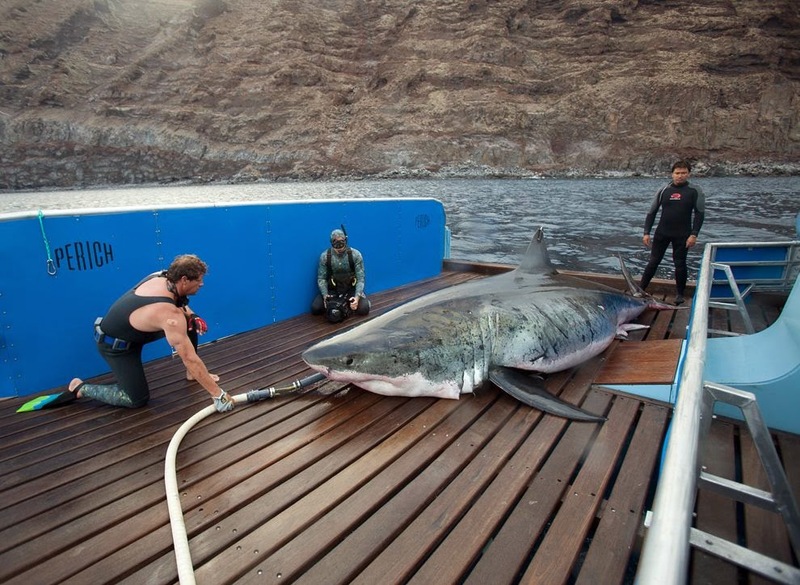 "I am incredibly proud of my crew for hauling in a record-breaking white shark like Apache," he says. "But I am more proud of the data we have collected from him and other white sharks to help ensure the well-being of this endangered species as a whole." All very cool stuff. As long as you're not in the water with Apache swimming around. A crew from Shark Men was at White's Point in San Pedro on Tuesday, May 9, to take chunks of blubber from the ship-struck humpback whale there to use as chum in upcoming expeditions. It was fun to meet them. According to the Canadian Shark Research Centre, the largest accurately measured great white shark was a female caught in August 1983 at Prince Edward Island off the Canadian (North Atlantic) coast and measured 6.1 metres (20.3 ft). The shark was caught by David McKendrick, a local resident from Alberton, West Prince. This is really so sad that day by day white sharks extincting from the ocean. This is a good example for us that we should help from getting Extinction. This is the right blog for anyone who wants to find out about this topic. You realize so much its almost hard to argue with you (not that I actually would want? Ha-ha). You definitely put a new spin on a topic thats been written about for years. Great stuff, just great!